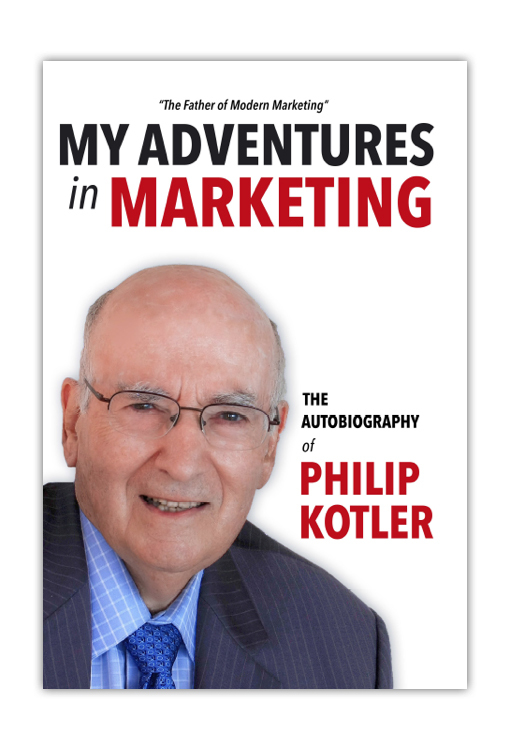 PHILIP KOTLER is known around the world as the “father of modern marketing.” For over 50 years he has taught at the Kellogg School of Management, Northwestern University, Evanston, Illinois. Kotler’s book “Marketing Management” is the most widely used textbook in marketing around the world. His autobiography, My Adventures in Marketing, tells his story – how a Ph.D. economist from M.I.T. became the world’s leading marketing authority. The following is an excerpt. Most of the commercial world spends its time trying to increase the demand for products and services. But we also need a science of “Demarketing” to help reduce the demand for certain products and services. It would be applied to reduce the demand for “vice” products such as hard drugs, cigarettes, and fatty foods. It would also be used to reduce the use of scarce resources, such as water, clean air, certain fish, and certain minerals. California doesn’t have enough water and in Beijing, 9,000 citizens are in hospitals with respiratory sickness because of the lack of clean air. For some things, the task is not marketing but demarketing. Today many people are concerned about the planet’s “carrying capacity” to provide the resources on the scale needed to support the world’s growing population and the needs of this and future generations. The “ecological footprint” concept says that we would need the equivalent of six to eight more earths of resources if all people in the world want to achieve the US living standard at the current rate of resource consumption. One generation can exploit the existing resources – oil, water, air, timber, fish – so intensely that the next generation is doomed to accept a lower standard of living. As the earth’s resources diminish, we may have to move from the Age of Marketing to the Age of Demarketing. If every company sets the goal of doubling its business and if all succeed, sustainability would be impossible to achieve. If the less developed countries achieve middle-class living standards, the pollution, road and air traffic, and energy power outages would smother their quality of life. Something between a zero-growth goal and a modest growth goal would make more sense. Sustainability-driven companies need to introduce clear criteria to direct their new product development programs, invest more in reuse and recycling, and convince their stakeholders – employees, channels, suppliers, and investors – to fight waste and accept some limits to growth. Companies will have to change their compensation package to set a better balance between the goals of growth vs. sustainability. The CEO needs to earn a pay-out based on achieving the planned growth rate while reducing environmental costs by a planned percent. Companies need to build demarketing thinking into their demand management strategy. Demarketing is another name for demand reduction. Four situations call for demand reduction. Managing an existing shortage. The Middle East is short of water and must ration it to competing users. Frequent energy blackouts in various countries require campaigns to discourage unnecessary or wasteful energy consumption. Avoiding potential shortages. Overfishing must be curtailed in order to maintain the fish supply. Timber cutting must be followed by active replanting. Minimizing harm to individuals. Efforts are needed to reduce cigarette smoking and hard drug use and eating foods too high in sugar, salt, and fat. Minimizing harm to nature or unique resources. Discouraging overcrowding at Yellowstone National Park or other over-attended tourist areas. Product. The government would order lower production of vodka. It might also limit consumers from buying more than one quart a week. Price. The government would substantially increase the price of vodka. Place. The government would limit the number of distribution outlets that sell vodka and make these outlets more difficult or inconvenient to visit. Promotion. The government would run advertising and news campaigns on the harm done to individuals and families by excessive vodka consumption. Demarketing efforts have been applied in a wide range of situations: to persuade legislators to limit the number of licenses for hunting and fishing, to discourage the number of visitors to overcrowded national parks, to persuade hotel guests to request fewer towels, to persuade homeowners to use less air conditioning and electricity, to persuade car buyers to purchase more fuel-efficient cars. There are cautions, however, when trying to reduce demand for a desired object. First, the demarketing campaign might make the product or service more desirable: banning a book or movie often has this effect. Second, it can create a criminal class that will prosper during the induced scarcity, as happened in the “prohibition era” in the U.S. when liquor was banned. Third, human rights advocates will complain about the government’s interference with what they consider citizens’ rights. Demarketing poses difficult choices between individual freedom and the public good. Without demarketing, we experience the Tragedy of the Commons where everyone uses too much of a public good. With demarketing, we experience a limit on our individual freedom. Demarketing works best when there is high citizen consensus that the consumption of some good or service should be reduced.